If you are pregnant or thinking about getting pregnant it can be a busy, enjoyable and occasionally stressful time! We strongly encourage those who may be experiencing difficulties in conceiving to contact us if they feel they would like advice or assistance. In the midst of buggies, baby monitors and all of the preparations it is important to think about your options in relation to accessing maternity care as well as getting ready for your postnatal care (after your baby is born). Every women who is pregnant and ordinarily resident in Ireland is entitled to free maternity care under the Maternity and Infant Scheme. You do not need to have a medical card or doctor visit card so it is open to ‘private’ patients too. This service is provided by your GP of choice and a hospital obstetrician that your GP refers you to-you do, of course, have the choice of what hospital or consultant you attend. Many patient enjoy this ‘shared care’ approach as we know our patients, we can offer them flexible appointments and we have all their medical information at our fingertips. It is possible to apply for the scheme and to attend your GP visits with us as well as paying for private consultant maternity care if that is what you prefer. You have lots of options that we can go through with you in detail. Some postnatal visits are covered also-at 2 & 6 weeks for your newborn baby and at 6 weeks for new mothers. We are delighted to operate the Maternity and Infant Care Scheme here in Portmarnock GP Clinic. You should attend us when you discover you are pregnant, i.e. after around 6-7 weeks and usually before 9-10 weeks. It is worth mentioning this when you are making your appointment. We will give you an information pack and ask you to sign a statutory form that covers the cost of your visits to us here in the practice (see below). The information pack contains details on your appointment schedule, immunisations you should think about and useful phone numbers as well as a brief overview of how the Maternity & Infant Care Scheme operates. 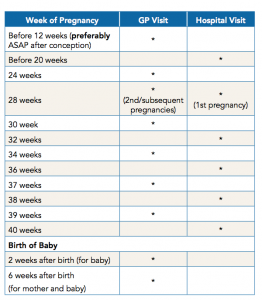 You should have your PPS number with you at this visit-this is used to register your pregnancy with the HSE. We will also give you a letter for your chosen hospital and you will need to contact the hospital out-patients to arrange your first antenatal visit (see below). The schedule of visits that is covered by the scheme is shown below. 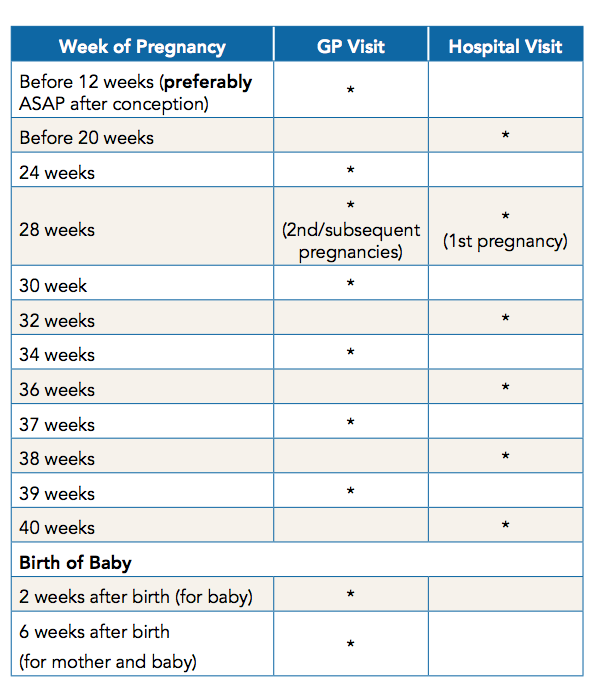 It is worth noting that visits not associated with your pregnancy are not covered by the scheme and if you do not have a medical card or doctor visit card then there will be a charge for these visits. As well as the Maternity & Infant Scheme we are delighted to be able to offer ultrasound scanning in pregnancy to our patients. Dr Laura O’Flynn has done an extensive course with many hours of hands-on training in the National Maternity Hospital and as a result she is fully equipped to scan patients in the comfort of our GP surgery here in Portmarnock. Dr Laura offers this service to those who register with her for maternity care and she usually scans after 8 weeks of pregnancy. We also offer the seasonal flu vaccine to our pregnant patients and we strongly advise that they avail of this service. The flu vaccine is advised for pregnant women (at all stages of pregnancy) and is safe to administer. It does not cause harm to your baby. It is also recommended that pregnant women should be given a pertussis vaccine between 16-36 weeks. It will not cause you any harm and it is essential to protect your baby. If you or your baby are in contact with whooping cough the antibodies will attack these bacteria and will protect you and your baby from whooping cough. The antibodies you pass to your baby in the womb decline rapidly in the first six months of life so it is important your baby gets the routine childhood vaccines (which include whooping cough vaccine) on time at 2, 4 and 6 months. (There is a charge to administer the flu & pertussis vaccines in pregnancy unless you have a valid medical card, the pertussis vaccine is provided after birth to newborn babies free of charge as part of the childhood immunisation programme). We are currently accepting new patients (pregnant or not!) and as well as running the Maternity Scheme, we also do childhood immunisations, the under 6 scheme for newborn infants and all necessary postnatal checks too. In addition to this, all our doctors are maternity trained. If you are pregnant and would like to join up to the Maternity & Infant Care Scheme please call us on 01-8461335 or 01-803881. You can also e-mail us on info@portmarnockgpclinic.ie. If you are currently trying to get pregnant and experiencing difficulties, please do not hesitate to get in touch with us for support and advice. Often the initial investigations (if any are needed) can be done here in our surgery in Portmarnock.